Last week at the Cavendish Hospital in Buxton, and at the Riverside Ward at the Newholme Hospital, we looked at music hall and our favourite acts which had grown out of the variety theatres which flourished about the country from the mid nineteenth century, but had all but disappeared by the 1960s, when the British public became stuck to the small screens of their TVs. New Mills had a music hall. I’d always end up sitting behind a lady with a big hat. And that was just the puppet. Singing a gutsy song, ‘The Pride of Our Alley’. She was a fine figure of a girl, our darling Sally. All over the plush red seats that tipped up. At Stanton Day hospital, we started thinking about laying the memorial wreath at the plaque that commemorates the role that Newholme Hospital played in World War One, as an auxiliary hospital. Do the young remember to remember? From the bombs that wrecked the city streets. Who remembers the female pilots, daring and clever? Just helped the hidden safely on their way. There’s no one alive to tell their story. Old, cracked voice recordings talking about the trenches. Letters, postcards, artefacts from the past. And into the future, in strange lands and deserts. We lay a wreath, to remember all wars. In the hope that one day, all wars will end. I’ve just come back from an exciting time at Newholme Hospital. The Dales Tales poetry anthology has now been officially launched! With a gathering of patients, hospital staff, the Friends of Newholme Hospital, and some dignitaries from Derbyshire County Council and Derbyshire Community Health Services, we introduced the project, read some of the poems, gave out copies of the beautiful looking anthologies, and enjoyed a good buffet! You can buy the book here, as a paperback or an e-book! Just click this link. All the proceeds go to the Friends Of Newholme Hospital. The hospital also officially unveiled the sculptures that staff and patients have been making to commemorate the centenary of the start of World War One. The patients have been working on a statue of a soldier and a nurse, to represent the work of Newholme Hospital as an auxiliary hospital for wounded soldiers. I never knew what my paternal grandfather looked like. He looks deep in thought. I hope you recover from your vital but difficult time-service. I hope you get home safe to be with your family and friends. The uniform looks very smart, but I’m glad I don’t have to wear the hat. Thank goodness we do not have to do your horrific training, to look after the sick. Whose lives and dreams are shattered. “Hello, I have been given the fictional name of Private William Henry Rowbottom. I have been created by the patients and staff on Riverside Ward as part of the Newholme Hospital commemoration project to mark the 100th anniversary of WWI. This seems especially fitting, as Newholme Hospital in Bakewell was one of the WWI auxiliary hospitals (60 beds), set up to care for the thousands of wounded soldiers returning from the Front. Well, suddenly, I appear to have risen up through the “ranks” from a mere Private to “ambassador”, almost overnight! An ambassador for patient experience, especially for those who have dementia. My role, on this occasion, is hopefully to make an important contribution to helping Health Professionals, carers and families to recognise how opportunities to participate in creative expression are essential to those people who have dementia, in order for them to continue to lead meaningful and fulfilled lives. In particular, I want to highlight how my “creators” were given the opportunity to work alongside their peers and the ward staff, to achieve a common goal, i.e. creating me! The wider goal, most importantly, is to honour those who served and died in World War One. This “collective and community” approach, generated a creative energy that actually allowed the Riverside patients to do and subsequently achieve things that perhaps, if they had been approached to do on their own, might have struggled to do. Riverside believes that this is an illustration of the power of connectedness and belonging. I hope that by story that we can enthuse and inspire others to embrace the Arts and promote opportunities for creativity across all healing and care environments, promoting not just innovative interaction, but also a sense of community, vitality and sense of belonging. On Saturday, a friend invited me to an open-air Shakespeare performance at Sheffield’s botanical gardens. Macbeth, performed by Heartbreak productions. It was one of those wonderful moments of serendipity to discover that the setting and “framing device” for this production was a World War One rehabilitation hospital. Using a pared-down cast, supplemented by an atmospheric choir for background atmosphere and sound effects, the cast of professional actors were playing the parts in Macbeth via the characters of the patients, soldiers recovering from physical and mental trauma, and the efficient but kindly Nurse Ruth Jones. 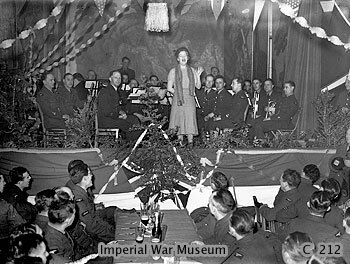 Before the play started, the patients and their nurse introduced themselves: gallant, troubled Captain Laurence Smith, who recited poetry about his experiences of the First World War, jovial Private Charlie Thompson, and lovable buffoon, gardening expert Major Cecil Harvey. This introduction set the scene for Macbeth as a “play within a play”, and enabled the audience to see the value of the therapy that the hospitals provided: woodwork, literature, gardening and country air to sooth traumatized minds and bodies. It was an excellent setting for the play, and made me think about the soldiers who recovered from their injuries at Newholme Hospital in Bakewell in the First World War. Although Newholme was officially a workhouse, a far cry from the Brighton Pavilion and the grand Clivedon estate, the fresh country air and the peace of the Derbyshire Dales must have seemed like a miracle after the madness, mud and misery of the trenches. And I’ve been to see the well dressing at St Mary’s in Walkley, the suburb of Sheffield where I live. In the First World War, our area of terraced houses and hills would have been densely packed and very close-knit. The loss of fathers, brothers and sons in the First World War would have hit the community very hard. 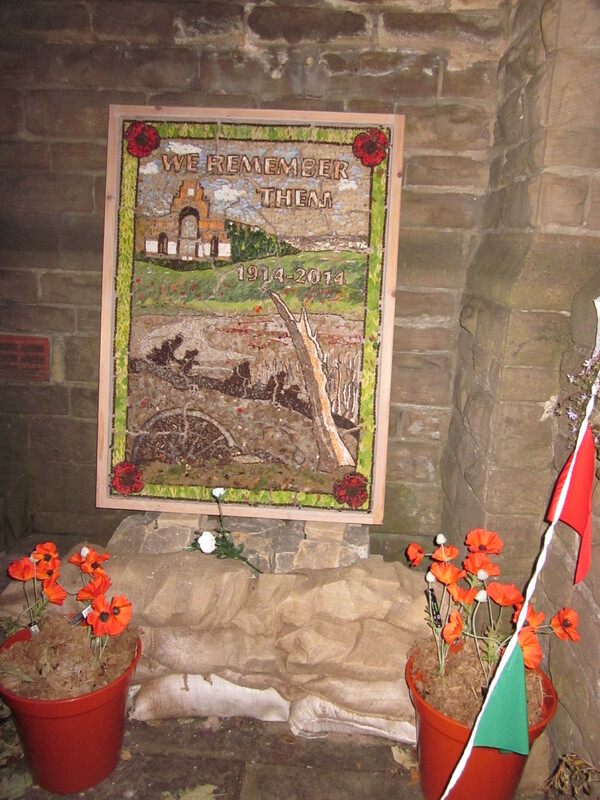 This year’s well dressing commemorates the young men lost in that war. The Walkley Community Centre, a beautiful Edwardian building, has a stained glass window with a list of Walkley men who were killed in the First World War, which is being restored and re installed this year.